Moved to GitHub long ago. Is so out of date that you shouldn't use it unless you know what you are doing. It was written to work with Ubuntu back in the 2010 era before all of the crazy Unity and Upstart and other weirdness Ubuntu started doing. Feel free to fork and fix it if you like. I'd be happy to send people to a new version somewhere. And it will work without re-downloading/installing. Mon Sep 13 22:40:51 UTC 2010 -- me a dummy. Another little new user issue. Typo of 'dev/null' for '/dev/null' caused initial iptables chain creation to fail. Also realized that syslog level is 'err' not 'error', which just goes to show that I hadn't actually had an error condition before. Since there may be some, might as well get this out of the way. Email bug reports, comments, requests, etc. to 'zengargoyle' at the wonderful 'gmail.com'. SelfControl for Linux 0.9 released! Latest should be NEWS.txt in the trunk. The name of the package has changed! It is now 'selfcontrol' instead of 'libselfcontrol-perl'. (I figured out enough of debian package management to use the tools directly vs. using the Perl module helper.) It should do the right thing when installed, i.e. remove the old libselfcontrol-perl package if it was installed. A 1.0 version should come soon, no improvements are planned for the next release, just documentation changes. This came about after a post to Ask MetaFilter requesting a Ubuntu version of the Mac OS X program 'SelfControl' by Steve Lambert. This version for Linux systems uses the Perl language (should be installed on any modern distribution), some Perl modules (YAML, Gtk2) which may be installed via the Comprehensive Perl Archive Network (CPAN) or may be available as installable packages via your distributions standard package management utilities. For example on Ubuntu (and Debian most likely) they are libgtk2-perl and libyaml-perl and can be installed with the Synaptic Package Manager, or with the apt-get command line tool. Also required but probably installed on most distributions are the IPTables firewall modules and tools (iptables) and the 'at' scheduling command. IIRC on my Ubuntu I just had to install the YAML Perl module, everything else was already available. YMMV. Download the selfcontrol-0.9.tar.gz Perl module and install it. Or, download the selfcontrol_0.9-1_all.deb Debian package and install it with 'dpkg'. The latest code can be found in the Subversion repository trunk. Warning! The trunk is usually under heavy changes. Watch the News for details. Run the SelfControl program. Either by using Alt-F2 or adding an Application Launcher to your Panel, or from the command line. See the Diagnostics section below before you try to run the program the first time if you wish to check things out. 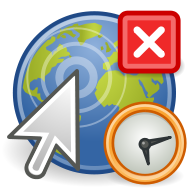 A list of hosts to block, pre-populated with 'www.example.com'. A Delete button which will delete the selected hosts from the list. It will *not* unblock them, just keep them from getting blocked for longer, and prevent them from showing up by default the next time the program is run. A text entry box with an Add button. To add a new host to block, enter the hostname in the box and click the Add button. Repeat as necessary. A slider that lets you set the number of *hours* you wish to block access to the listed hosts for. A Cancel button. Click this and the program will exit without doing anything. You can also click the close window button to achieve the same effect. A Start button. Click this and you will be prompted for your password. Once entered, the hosts you listed will be blocked for the time you specified and the window will go away. Also, new in this release. Menus! Start/Quit do what you would expect. Active Blocks will show you the currenly active blocs (maybe, see below). About give a little information about the program. If you do nothing, Active Blocks will show you a sortable list of sites thay may currently be blocked. It goes through a list of blocks and keeps the longest acting block found. For example: you block example.com for 15 minutes, and then re-block it for 25 minutes. The list will show example.com as being blocked until 25 minutes (not showing both blocks). Here's the problem, even 30 minutes later it will still show example.com and the time it should have been unblocked. This is because the program can not really check on the status of blocks without root access (you would have to type your password.) The current workaround should you wish to use it is Magic. This lets you run the 'atq' program as root to query the 'at' jobs that do the unblocking. Then edit your '.selfcontrol' file in your home directory and change the 'can_queue: 0' line to 'can_queue: 1'. Now SelfControl will only show actually active blocks in the 'Active Blocks' window. Which will let you not have to type your password even when Starting a set of blocks. I do this myself, and would have the installation process do it automatically but I don't like messing with peoples system security, sorry. If they don't, this program may not work for you. Let me know what you see and I'll try and add functionality to handle it. You might see something different if you already have firewalls installed and operating. You should see a date in the future when your blocks will be unblocked. 127.0.0.2 www.example.com # SelfControl - DO NOT EDIT! will be added to the end, and removed via an 'at' job just like the iptables rules.